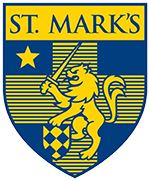 St. Mark’s Wrestling hosted and wrestled in the Texas Prep State Wrestling Championship on February 2, 2019. Over 170 wrestlers from 23 SPC and TAPPs wrestling teams competed in this year’s Prep State tournament, and St. Mark’s placed 11th as a team. Senior captain Colin Neuhoff (170lbs) continued his tough wrestling and finished fourth place in the state competition. Other notable finishes were freshman Jedidiah Kim (126lbs) tied for 5th and sophomore Jackson Fair (152lbs) tied for 5th. The Lions compete next in the Southwest Preparatory Conference Championships at Ft. Worth Country Day on Saturday, February 16, 2019. The varsity basketball team competed in two games this past week. On Tuesday, the Lions traveled to Dallas Christian for a non-conference game featuring teams both currently in first place in their respective leagues. The pace was high-octane, and the 3-point shooting terrific. St. Mark's led by double digits throughout most of the game, but with 3 minutes to play in the fourth quarter, the lead was cut to 8. Fortunately, the Lions finished the game on a 6-0 run to secure the 84-70 victory. Junior Andrew Laczkowski, sophomore Harrison Ingram, and freshman Colin Smith each tallied at least 19 points and 11 rebounds and then followed that performance with another strong outing against Cistercian Friday night (each of them once again scored in double figures!). Unlike Tuesday night's up and down contest, however, Cistercian's style of play was much slower. The Lions were forced to show some early poise by patiently winning possession after possession. After trailing by 1 at the end of the 1st quarter, the Marksmen strung together several scores in the 2nd quarter and came away with a 59-39 win. Harrison Ingram finished the week with 45 points and 21 rebounds to earn Dallas Morning News Player of the Week honors. The story can be found HERE. All remaining games on the schedule will have immense SPC tournament implications. The Lions host Oakridge at 7:00 pm on Senior Night in their final home game of the season on Tuesday night in a battle of the North Zone's unbeaten teams, and on Friday, St. Mark's travels to ESD for a 7:00 p.m. game. Fan Blizzard Friday produced the largest, most vocal crowd at a varsity soccer match since St. Mark’s hosted (and won) the 2013 SPC Championship. The match proved to be one of the most exciting of the season with both teams creating excellent chances but each defense doing just enough to keep clean sheets. Senior goalkeeper William Haga and junior goalkeeper Billy Lockhart were instrumental in preserving the shutout. The deadlock was broken in the 74th minute when sophomore Henry McElhaney’s hopeful ball found the head of freshman Noah Soliz near the edge of the penalty area. Soliz flicked the ball over an onrushing Hawks goalkeeper and the ball trickled into the goal, at which time an already fervent crowd erupted into jubilation. Cistercian turned up the pressure in the final minutes in search of the equalizer. With the Hawks committed to attack and the final whistle about to blow, St. Mark’s countered with deft touches from McElhaney and junior William Holtby that allowed senior Lyle Ochs to get in behind the Hawks back line where he coolly slotted the ball past the Cistercian keeper. The shutout of Cistercian results in St. Mark’s taking sole possession of first place in the SPC North Zone. 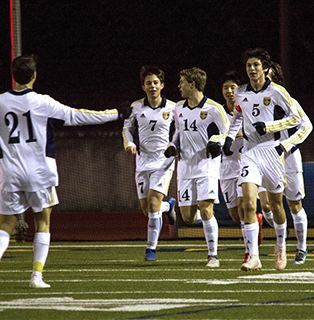 Currently, on thirteen points (4 wins, 1 draw), the Lions will host Oakridge on Tuesday night (6:00 p.m.) knowing that a win secures the top seed in the north zone, guaranteeing a first-round bye at the SPC tournament. The varsity swim team did not compete last week. This week, the Lions host Ft. Worth Country Day and All Saints on Thursday (5:45 p.m. start) for Senior Night. Come out and cheer on the seniors in their last home event! Parker Dixon ’16 continued his strong start to his junior season as the starting outside hitter for the Princeton Tigers Men’s Volleyball team with two monster games on the Tigers’ west coast road trip. Dixon led the Tigers with a career-high 25 kills (.447 hitting percentage) and 6 digs in the Tigers win over UC San Diego on Jan. 29. Parker then had 24 kills (.487 %) and 8 blocks in a thrilling 5 set loss to the #12 ranked Cal State Northridge on Feb. 1. For his efforts, Parker was named EIVA Offensive Player of the Week, the 2nd time he has earned this honor this season. Parker is also among the top-ranked hitters in NCAA D-1 in kills per set, currently ranked 15th in the nation. For those of you that watched the Super Bowl this past Sunday, you may have seen a familiar face on one of the NFL’s “Inspire Change” commercials. Chicago Bears linebacker Sam Acho, St. Mark’s class of 2007, was one of the featured NFL players in the commercial which can be seen HERE that aired during the 2nd half of the Super Bowl.